Thiền or Thiền Tông is the Vietnamese word for Zen Buddhism. The word is derived from the Chinese Chán. According to traditional accounts in Vietnam, in 580, an Indian monk named Vinitaruci (Tì-ni-đa-lưu-chi in Vietnamese) traveled to Vietnam after completing his studies with Sengcan, the third Patriarch of Chinese Chán. With this event Vietnamese Thiền Buddhism came into existence. The school that Vinitaruci and his Vietnamese disciple founded would become known as the oldest of Thiền in Vietnam. By the 10th century, the Vinitaruci School became one of the most influential Buddhist groups in Vietnam, with the Patriarch Vạn-Hạnh, who demised in 1018. Other early Vietnamese Thiền schools were the Vô Ngôn Thông, which was associated with the teaching of Mazu Daoyi (709–788), a Zen teacher in medieval China, and the Thảo Đường, which incorporated nianfo (a Pure Land practice that generally refers to the repetition of the name of Amitābha Buddha) chanting techniques. Both were founded by Chinese monks. King Trần Thái Tông , the first King of the Trần Dynasty, founded a new school, the Trúc Lâm-Yên Tử (Bamboo Forest on Yên Tử Mountain) school, which was Vietnamese by nature and origin, but which was also somewhat influenced by Confucian and Taoist philosophies. This incorporation of the three major philosophies in Asia (Buddhism, Confucianism, and Taoism)is typical of Vietnamese Thiền Tông . In the 17th century, a group of Chinese monks led by Nguyên Thiều established a vigorous school, the Lâm Tế, which is the Vietnamese pronunciation of Linji. A more domesticated offshoot of Lâm Tế, the Liễu Quán school, was founded in the 18th century and has since been predominant in Central Vietnam. Thich Nhat Hanh's meditation practices come from this Thiền school. Most Venerable Thích Thanh Từ, one prominent and influential Vietnamese Thiền master, restored Trúc Lâm-Yên Tử Thiền Tông in Việt Nam. He currently resides at Trúc Lâm Thiền Monastery in Dalat, Vietnam. He was a disciple of Most Venerable Thích Thiện Hoa. The most famous practitioner of syncretized Thiền in the West is Thích Nhất Hạnh who has authored dozens of books and founded the Plum Village in France. During the Vietnam War, Thich Nhat Hanh was a monk and a peace activist. He was nominated for the Nobel Peace Prize in 1967 by Martin Luther King, Jr. In 1966. He left Vietnam in exile and now resides at Plum Village, a monastery in France. He has written more than one hundred books about Buddhism, which have made him one of the very few most prominent Buddhist authors among the general readership in the West. In his books and talks, Thich Nhat Hanh emphasizes mindfulness as the most important practice in daily life. There is also another notable Vietnamese Zen master who has been influential in Western countries: Most Venerable Thich Thien-An. Thich Thien-An came to America in 1966 as a visiting professor at UCLA and taught traditional Thien meditation. 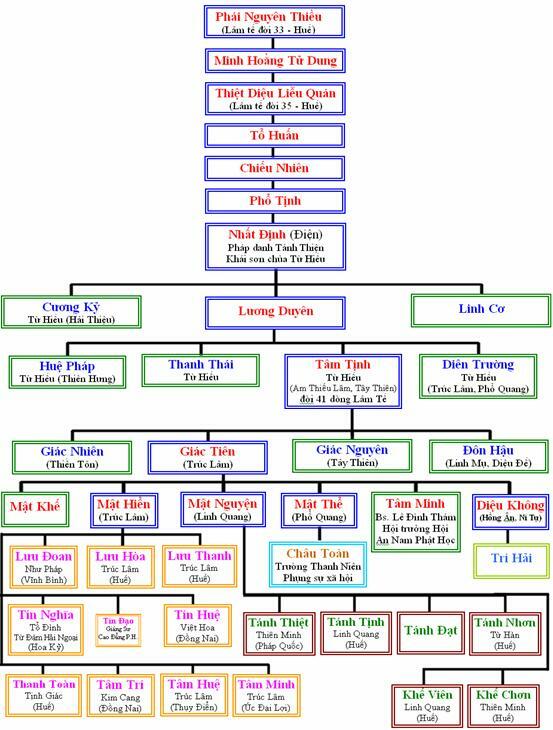 Vietnamese personal names generally consist of three parts: a family name, a middle name, and a given name, used in that order. The "family name first" order follows the system of Chinese names and is common throughout the Chinese cultural sphere, but is different from Chinese, Korean, and Japanese names in having a middle name. Persons can be referred to by either the whole name, the given name, or a hierarchic pronoun in normal usage. Thích (釋) is Vietnamese for Sakya (J. Shaku 釈), which is the Buddha's family name. Every monastic member in the Vietnamese Buddhist tradition has a name which begins with Thích. --- Hòa-thu'ọ'ng 和尙 (S. Upādhyāya, C. Heshang, J. Oshō). Buddhist monks & nuns have three names: 1. lineage name (pháp danh 法名) / 2. Dharma name (pháp tự 法字) / 3. Dharma title (pháp hiệu 法號). Khương Tăng Hội (?-280)was born and brought up in Giao Chỉ (North Vietnam now). His parents may have come from Khương Cư (Sogdiana, the region that is now called Uzbekistan and Tajikistan). It was also said that his father was from Sogdiana, and his mother from Giao Chỉ (Vietnam). His parents died when he was ten. He later became a monk who excelled in Dharma practice, and mastered both Chinese and Pāli. Later he traveled, and spent some periods of time in China and in India. He came to Kiến Nghiệp (Nankin, China)in 247. He passed away in 280, after staying in China for 33 years. He was considered the founder of Thiền in Việt Nam, and expounded the Dhamma in Luy Lâu, the famous Buddhist Center at that time. He also contributed to the development of Chinese Chan. He was famous for his Collection of Sutras about Lục độ (the Six perfections,Skt. pāramitā: donation, discipline/precepts, tolerance/forebearance, effort, meditation, and wisdom). According to Nguyễn Lang, this work not only contained sutras about the Six perfections (Skt. pāramitā), but in it there are passages written by Khương Tăng Hội himself. Khương Tăng Hội's next important work was his translation of the The Ānāpānasati Sutta (Pāli)/the Four-Object Mindfulness Discourse Sutra. It was he who clearly explained the Mahayana meditation, which emphasized Emptiness and Buddha Nature in practice. Trường An. When Buddhism was suppressed in 574, he traveled to the land of Nghiệp (Hồ Nam). He met the Third patriarch of Chinese Ch'an, Tăng Xán (Sengcan), who took refuge on Tư Không Mountain. Tăng Xán told him to go South immediately. In 580 he came to Quảng Châu, and entered Giao Châu (Vietnam), where he stayed at Pháp Vân Temple (Dâu Temple now),in Luy Lâu. He later chose Pháp Hiền as his disciple, and founded a school of Vietnamese Thiền. This school continued for 19 generations of masters, from 580 until 1213. It was influenced by Tăng Xán's teachings, and at the same time mixed with some local rituals and spiritual traditions in Giao Châu. Vô Ngôn Thông was from Quảng Châu. His last name was Trịnh. He became a monk at Song Lâm Temple, Vũ Châu. In 820, under the Tang Dynasty, Vô Ngôn Thông came to Việt Nam, stayed at Kiến Sơ Temple, Phù Đổng Village (Gia Lâm, in the suburbs of Hà Nội nowadays). Vô Ngôn Thông often sat meditation, facing the wall, in complete silence for many years. Nobody paid attention to him, except a monk named Lập Đức, who could understand him. Later Vô Ngôn Thông accepted Lập Đức as his disciple, and changed the latter's name to Cảm Thành, and taught the Dhamma to him. Vô Ngôn Thông passed away in 826, after 6 years at Kiến Sơ Temple. Vô Ngôn Thông School continued its practice through 17 masters until the 13th century. This school was influenced by Chinese Ch'an more than the Tỳ Ni Đa Lưu Chi, in its monastic organization, the use of koan, and the influence of the Pure Land tradition. It used many sutras, the Prajnaparamita, the Viên Giác, and the Lotus sutra, with an emphasis on Mind-Buddha in sudden enlightenment, and had profound and practical influences in society. Thảo Đường was a Chinese monk, who lived in Cham (South of Đại Việt/Vietnam). He became a prisoner of war during the Cham occupation led by the Vietnamese King Lý Thánh Tông in 1069. In Đại Việt, Thảo Đường was discovered by the religious King himself, and was highly respected. King Lý Thánh Tông invited him to become the abbot of Khai Quốc Temple, and promoted him to be the Royal Advisor (Quốc sư). He became the first patriarch of another Thiền school in Đại Việt, which bore his name. King Lý Thánh Tông would later become the second patriarch. Thảo Đường originally was a disciple of Tuyết Đậu, a subsect in Chinese Chan, which belonged to the Vân Môn sect. Tuyết Đậu subsect had an academic characteristic, for its frequent use of poetry to express Thiền spirit, and its incorporation of both Confucianism and Buddhism. That was why Thảo Đường School was the best fit to the Ly dynasty, a time when Buddhism was well developed and began to have a profound influence on Vietnamese Buddhist scholars. According to “Thiền uyển tập anh” ("A Selection of Thiền Garden Poems"), there were 6 generations in the Thảo Đường School, including 19 partriarchs , of whom 10 were monks, and 9 were lay Buddhists, chiefly from the royal family and their subordinates. Thảo Đường has been considered an academic Vietnamese Thiền school that had a great influence in Vietnam, and that led to the birth of an authentic Vietnamese Thiền school in the a Trần dynasty, the Trúc Lâm-Yên Tử (Bamboo Forest-Yên Tử Mountain). Trần Thái Tông (1218 – 1277) was the first king of the Trần Dynasty. He reigned for 32 years (1225 - 1258), and remained as the Royal Father for 19 subsequent years. His name was Trần Bồ, which was later changed to Trần Cảnh. His father was Trần Thừa. Trần Cảnh was born on June 16 of the year of the rooster (that is, July 10, 1218), under Kiến Gia the Eighth of the Lý Dynasty. When he was born, the Trần clan had already seized key positions of the Lý. Arranged by his uncle Trần Thủ Độ, Trần Cảnh married the first and also the last queen of the Lý Dynasty, Lý Chiêu Hoàng, when he was only 7 years old. At the end of 1225, Trần Thủ Độ forced the queen to cede her throne to her husband. An orphan at he age of 8, King Trần Thái Tông had to rely on his uncle Trần Thủ Độ for advice. Later he was forced to marry his pregnant sister-in-law to get an heir. He became remorseful, and silently left the throne to go to the mountain to seek help from the National Master who was a well-respected monk named Phù-Vân. The hermit told him to return to the capital and complete his responsibilities as a king. Trần Thủ Độ and all the king's subordinates and servants also tried to find him and threatened to kill themselves if he denied his kingship to become a monk. Finally he listened to Phù-Vân the National Master and returned to rule his country. During the time when Trần Thái Tông was the king, he changed his royal name three times: Kiến Trung (1225-1232), Thiên Ứng Chính Bình (1232-1250), and Nguyên Phong (1251-1258). Trần Thái Tông had successfully led the Đại Việt people in their fight against the first aggression of the Nguyên Mông (Mongolian) invaders. After 19 more years in public service, Trần Thái Tông demised on April 1 the year of the ox (May 5, 1277), at the age of 60. After ceding his throne to his son Trần Hoàng (later King Trần Thánh Tông), Trần Thái Tông focused on studying and practicing meditation (Thiền) between 1258 and 1277. His works included: three versions of his writings about Thiền (Khóa-Hư-Lục) and two poems from King Trần Thái Tông's Collected Works in Verse and Prose(Trần Thái Tông ngự-tập), which was lost. Trần Nhân Tông (1258 – 1308), whose name at birth was Trần Khâm, was the third king of the Trần Dynasty. His father was Trần Thánh Tông, and his mother was Nguyên Thánh Thiên Cảm the Mother Queen (Trần Thị Thiều). His successor was Trần Anh Tông. He was born on November 11 in the year of the horse, and demised at the age of 51 at Ngoạ Vân Hermit Hut on Yên Tử Mountain. Later he was buried at Đức lăng (Thái Bình Province nowadays). He reigned for 15 years (1278 – 1293), and served as the Royal Father for 15 more years. He had been a monk for 8 years with the Dharma name the Enlightened Royal Master (Đầu đà Hoàng giác Điều ngự), and was the founder of Thiền Trúc Lâm-Yên Tử School. In Vietnam history he was always considered one of the best, and the most heroic kings. Under his rule, and with the advice from his Royal Father Thánh Tông, from 1285 to 1287 Đại Việt had defeated the Mongolian invaders two times. After ceding his throne to his son Trần Anh Tông, he became a monk and practiced the Dharma at Vũ Lâm, Ninh Bình Province. Afterwards he moved to Yên Tử (Quảng Ninh) , and founded Thiền Trúc Lâm-Yên Tử School, with the Buddhist name Điều Ngự Giác Hoàng (the Enlightened Royal Master) or Trúc Lâm đầu đà (Trúc Lâm the Ascetic). He was the First patriarch of this Vietnamese Thiền School. That was why he was also called the “Buddha-like King.” He demised on Novemebr 3, 1308, and was buried in a vault at Quy Đức,Long Hưng County. His relics were preserved at Ngọa Vân Stupa. In Hanoi there is a boulevard named after him in Hai Bà Trưng District. Pháp Loa (1284-1330) was a Thiền master of the Trúc Lâm-Yên Tử School. He was Trần Nhân Tông’s disciple, and the Second patriarch. It was he who took charge of the publication of the Vietnamese Tripitaka about 1329. He also wrote many famous works about Thiền, and treatises on Lankavatara Sutra (Nhập Lăng-già), Lotus Sutra (Diệu pháp liên hoa), Prajnaparamita Sutra (Bát-nhã-ba-la-mật-đa). (Ái Quốc, Hải Dương City, Hải Dương Province). His father was Đồng Thuần Mậu, and his mother was Vũ Từ Cứu. It was said that his mother dreamt of being given a magic sword one night, and after that she got pregnant. Before he was born, his mother had given birth to eight daughters. She was afraid of having another baby girl, so she tried to abort the fetus. After her four attempts without success, a baby boy was born, and was named Kiên Cương, which meant “solid and strong.” During his childhood, he was quite different from other kids, for he never had unskillful utterances, and he refused to eat meat and fish. In 1304, the Enlightened Royal Master Trần Nhân Tông traveled all over the country, in search for a successor. When he came to Kiên Cương’s village, the latter prostrated in front of the Master, asking him to accept him to become a monk, Trần Nhân Tông said: "This boy has the Dharma eyes; he would become a Dharma means later," and allowed Kiên Cương to receive the precepts to become a novice. The Master also told him to go to Quỳnh Quán to learn with Most Venerable Tính Giác. After his training at Quỳnh Quán was completed, the disciple returned to learn with his Master. One day, Pháp Loa presented to his Master three stanzas to chant, all of which were turned down. The Master told him to study further by himself. Pháp Loa went to his own room, started to contemplate in depth, and stayed up till it was past midnight. When he saw the burning candle wick falling down, he immediately got enlightened. The Master silently granted him the Dharma transmission to become his successor. From that moment on he started to practice the twelve precepts of an ascetic. The following year, the Master himself granted Pháp Loa the Thanh văn (for those who learned the Four Noble Truths, and based their practice on these Truths) and the Boddhisattva precepts. In 1306, following his Master’s instruction, Pháp Loa began to disseminate the Dharma at Báo Ân Temple at the age of 22. Here he met Huyền Quang the first time. When the Master demised two years after that, it was Pháp Loa who was assigned to bring the relics to the capital. When he returned to the mountain, he gathered and arranged his Master’s works when the latter practiced the Dharma at the Stone Hut under the pen name Thạch thất mị ngữ (Secret Words from the Stone Hut). For more than forty years, now the dream was over. The immense space of liberation moon and wind on the other shore. He put the brush pen down and passed away at the age of 47. His body was buried at the Thanh Mai Mountain Stupa. and the above stanza which was composed before his death. Huyền Quang (1254-1334) was named Lý Đạo Tái at birth. He was from Vạn Tải, Nam Sách County, Lạng Giang Provinve (Thái Bảo Village, Gia Bình District, Bắc Ninh Province nowadays). He excelled academically both in his hometown, and in the capital. He achieved the highest score (đệ nhất giáp tiến sĩ/trạng nguyên) in the National Exam held in the capital in 1272 or in 1274 (? ), and was invited to join the Royal Internal Affairs Academy (Viện Nội Hàn). He was also the key figure at meetings with venerable monks from the northern kingdom/China, for he was eloquent and very well verse in prose and poetry. Later in his life he resigned and became Trần Nhân Tông’s disciple at the Bamboo Forest (Trúc Lâm). A Thiền master in Việt Nam, and the Third patriarch of the Trúc Lâm Yên Tử School, he was also a great poet whose works have been preserved, studied, and enjoyed for generations. Together with Trúc Lâm the Ascetic (Trúc Lâm Đầu Đà) Trần Nhân Tông, and Pháp Loa, he has been considered one of the great Thiền masters in Việt Nam, whose spiritual attainments were comparable to those of the six Chinese patriarchs, and the twenty eight patriarchs of ancient India. According to The Archival Records of the Three Patriarchs (Tam tổ thực lục, 三祖實錄), Huyền Quang’s mother, Lê Thị, often went to Ngọc Hoàng Temple to pray for a child, for she was thirty years old but had not yet had one. In the year of the tiger of 1254, the abbot at that temple, Huệ Nghĩa, had a special dream. In his dream all the wards in the temple were brightly lit; all the Buddhas were in deep meditation, and many Bodhisattvas and Heavenly Guards gathered in the temple. The Buddha said to Ananda, “You shall be reborn to become a Dharma tool in the East. Remember your previous vow?” That year Lê Thị gave birth to Huyền Quang. As he grew up, he had a special appearance, and was appointed a high rank in the Royal Academy. In the royal year of Đại Khánh the Fourth (1317), he received the Dharma transmission from Pháp Loa. After Pháp Loa demised (1330), he became the Third patriarch of Trúc Lâm School, but because of his old age, he designated responsibilities to the National Master An Tâm. He had been the abbot of Thanh Mai Mountain Temple for six years, and moved to Côn Sơn to disseminate the Dharma. On January 23 the year of the dog (1334), he passed away at the age of 80. King Trần Minh Tông honored him as The Great Third Generation Trúc Lâm Thiền Master, Huyền Quang The Respected Compassionate One. Tuệ Trung Thượng Sĩ , whom King Trần Nhân Tông considered his master, was a famous lay Buddhist practitioner of Thiền Trúc Lâm School. His Tuệ Trung Thượng Sĩ's Collection (Tuệ Trung Thượng Sĩ ngữ lục) and Khoa Hu Collection(Khoá hư lục )were fundamental to the Trúc Lâm School's thoughts and teachings. After three master generations of Trần Nhân Tông, Pháp Loa, and Huyền Quang, this Thiền School lost its influence to Confucianism for a while. Until the second half of the Lê Dynasty (Lê Trung Hưng 1533-1789) it almost regained its strong cultural and religious position it used to have before in the 14th century. During the Buddhist Restoration Movement in the middle of the 20th century, many venerable monks and Thiền masters wanted to rebuild the Thiền Trúc Lâm School, but this is still a controversial matter among Buddhist scholars. Chuyết Chuyết was born in China in 1590. His name was Lý Thiên Tộ at birth. His Buddhist names were Hải Trừng. Later when he became a monk, his name was Viên Văn. He left China for Cambodia n 1630, and entered Đại Việt through Cham (Chiêm Thành) in 1633. After the Mother Queen Trịnh Thị Ngọc Trúc and Princess Trịnh Thị Ngọc Duyên became nuns at Phật Tích Temple, Lord Trịnh Tráng began to rebuild Ninh Phúc Temple, Bút Tháp, and invited Chuyết Chuyết to be its abbot. Chuyết Chuyết's statue can be found in Phật Tích Temple nowadays. He belonged to the 34th generation of Línjì/Lin-chi (Lâm Tế) School in China. It was he who taught this Thiền in Đại Việt (Vietnam). One special trait if this School was that it followed the four guidelines(“tứ liệu giản”), clear formula, and selected or graded levels of perception of the subject and the object. After Nguyễn Hoàng began to rule the South (the beginning of the 17th century), a Buddhist center started to develop in Thuận Hoá. Besides strengthening their rule in the South, in order to prevent foreign influence of Western ministers, many lords of the Nguyễn focused on developing and spreading Buddhism in the South, so they invited many respected monks from China. Many of these monks were from the Lâm Tế School. Some were abbots of temples in Thuận Hoá, such as Thiền masters Viên Cảnh, Viên Chiếu, Nguyên Thiều...and many others. Hence the Liễu Quán subsect came into existence. Liễu Quán was from Bạch Mã Village, Đồng Xuân County, Phú Yên Province. He was born into a poor family, and started a monastic life at the age of 12. In 1697, he learned Buddhism in Thuận Hoá. After many years of traveling from temple to temple to learn the Dharma, at 41, he was accepted by Thiền master Tử Dung as a disciple and began to disseminate the Dharma to many congregations in Thuận Hoá và Phú Yên. He demised in 1742. Many researchers believe that Liễu Quán had Vietnamized the Lâm Tế School, so it now has Vietnamese characteristics. Before Liễu Quán, the Buddhist congregations in the South had some of the Cantonese (Quảng Đông) characteristics that were introduced from the two east and west Southern regions of China. With Liễu Quán, Lâm Tế retained its original academic characteristics, as for its method of disseminate the Dharma, it was completely Vietnamese. Ly Cong Uan /Ly Thai To(1010-1088), an adopted son of the respected monk named Ly Khanh Van at Co Phap Temple, learned Buddhism from Thiền Master Van Hanh. He helped restored old temples, and built new one such as Hung Thien Ngu, Van Tue, Thang Nghiem, Then Vuong, Thien Quang, Thien Duc, Cam Y, Long Hung, Thanh Tho. he also ordered to cast new bells. In 1019 the King sent two subjects Pham Hao and Nguyen Dao Hung to China for copies of sutras, and asked a Thien Master named Phi Tri to preserve the sutras in the royal archives. It was the second time Vietnam sent subjects to China in order to receive copies of sutras. In 1020 the king ordered to build a big Buddhist Hall for Dharma talks in the capital, and sent monks all over the country to spread Buddhism. In 1024 he ordered to build Chan Giao, another hall inside the royal palace, and invited well-known monks to teach the dharma there so he could learn. These famous monks were Thien Masters Van Hanh, Sung Pham, and Da Bao. They were from either the Vo Ngon Thong or Ty Ni Da Luu Chi Schools. Thien Master Van Hanh was from Co Phap Temple (Dinh Bang, Tu Son, Bac Ninh). All we learned about him was that he was born into a Buddhist family, and his last name was Nguyen. Since early childhood, he was already very intelligent, and had learned many Buddhist sutras and treatises, as well as understood the core of Confucianism and Taoism. He became Thien Master Dinh Hue's disciple at the age of 20, learned Thien from Dao Gia, the Second Master of the Ty Ni Da Luu Chi School. Before Van Hanh passed away (1018), he left a famous Thien stanza. Thien Master Da Bao was the abbot of Kien So Temple (Phu Dong). He was the disciple of Khuong Viet The National Master (Vo Ngon Thong School). Since he often traveled from place to place to teach Buddhism, nobody knew much about him, or when and where he passed away. The disciple who received his Dharma transmission was Dinh Huong. Under the leadership of the most religious Buddhist King in the Ly Dynasty, King Ly Thai Ton (1028-1054), 95 more temples were built in 1031. Three years later in 1034 the Song Dynasty in China sent their subjects to Vietnam to donate copies of the Tripitaka, which were received in a grand ceremony. In 1036 King Thai Ton ordered to renovate the old Buddha statues in many temples. It was said that there were two monks who attained enlightenment during this period, Nghiem Bao Tanh and Pham Minh Tam. From 1034 to 1038 the King often came to Thien Master Thuyen Lao to learn the Dharma and to beg to become his disciple. He was at last given the Dharma transmission, and became the seventh master in the Vo Ngon Thong School. Famous Thien masters of the Vo Ngon Thong School at the time were Cuu Chi, Bao Tanh, Minh Tam, Hue Sinh, Dinh Huong, Da Bao, Thuyen Lao. The King also practiced Thien and learned Buddhism enthusiastically. In 1049 he ordered to build Dien Huu Temple (Chua Mot Cot/One-Pillar Temple near Hanoi), a typical Vietnamese Buddhist construction of all times. Another Buddhist King, Ly Thanh Ton (1054-1072) was very kind and compassionate to the poor and prisoners. He often ordered his subjects to treat them kindly in the prison, and to reduce their sentences, for they committed crimes because of their ignorance. In 1056 the King ordered to build Sung Khanh Temple, Bao Thien (Tien Thi, Tho Xuong or Hanoi nowadays), with a 12-story stupa and to cast a big brass bell. Tào Động was from China. It came to Việt Nam with Thiền master Thủy Nguyệt (Tông Giác). But according to Nguyễn Lang, in the South of Đại Việt, the first to introduce Thiền Tào Động School to Đại Việt was Thiền Master Hưng Liên, who was the abbot of Tam Thai Temple, Quảng Nam province, and who was assigned the National Master (Quốc Sư). Afterwards, Thiền Master Thạch Liêm from Canton (Quảng Đông) was invited by Lord Nguyễn Phúc Trăn to Thiền Lâm Temple to teach Thiền Tào Động. Thạch Liêm combined both Tào Động and Pureland (Thiền and Tịnh độ), and introduced the Dharma to the multitude. Gradually, Tào Động mixed with Lâm Tế in the South and formed the Lâm-Tào practice in many Southern congregations. Thiền Master Chân Nguyên was born Nguyễn Nghiêm, at Tiền Liệt Village, Thanh Hà District, Hải Dương Province, in 1646. He became a monk with the Buddhist name Tuệ Đăng at the age of 19, and learned Buddhism with Thiền Master Chân Trú at Hoa Yên Temple. He received the Trúc Lâm School transmission from his master, and became the abbot of Long Động và Quỳnh Lâm Temples. His Thiền method emphasized direct realization of the Buddha Nature. According to Nguyễn Lang, regarding Chân Nguyên's method, the key to enlightenment was the nurture of the realization of Buddha Nature. With this realization, every thought and action naturally stayed in the realm of enlightenment, without any magical power. It is through the eyes, the ears, the nose, the tongue, the body, and the consciousness (six senses) that the practitioner realizes the Real or the Buddha Nature. Chân Nguyên demised at the age of 80. His major contribution was his starting and encouraging academic activities among Buddhists at the time, such as the translation of many Buddhist works and studies, which have been well preserved until now. Thiền Master Hương Hải was from Áng Độ Village, Chân Phúc District (later renamed Chân Lộc, then Nghi Lộc), Nghệ An Province. His ancestors came to the South to support Lord Nguyễn, and stayed at Phủ Thăng Bình (Quảng Nam). After many years as a monk, he was invited by Lord Nguyễn to serve in the Royal Palace. After some false accusation, he quietly traveled to the North in 1683, at the age of 56, and at the end off his life he became the abbot of Xích Đằng Temple, Kim Động, Hưng Yên City nowadays. Hương Hải proposed the social engagement approach, and continued to follow the fundamental guidelines of Trúc Lâm School; but he also introduced some new elements, such as bringing Buddhism to the multitude, pointing out the relationship between the mind and the external phenomena, illusion versus enlightenment, and the good versus the evil.